Did you know that office chairs can be highly destructive to carpet? Pull out the chair you’re currently sitting on and inspect the carpet underneath. These days, the use of ergonomic office chairs in Melbourne is beneficial for keeping our joints aligned, decreasing the stress placed on our bodies and for reinforcing good posture habits. How Does A Pneumatic Office Chair Work? How Does An Ergonomic Office Chair In Melbourne Prevent Back Pain? Many workplaces are investing in ergonomic office chairs for their employees because they are supposed to enforce good posture whilst sitting, which is said to lessen strain on the back. Spending most of your day, 5 days a week at work can lead to all sorts of stains and dirt finding their way onto your office chair. In most workplaces, employers would love to find ways to boost the productivity of their workers. If you work in a Melbourne business, chances are that you spend a good part of the working day sitting in an office chair. Sound about right? There seems to be this belief that leather office chairs are the ultimate in business furniture – owning one shows that you are ‘at the top’, that you ‘have gotten somewhere’. 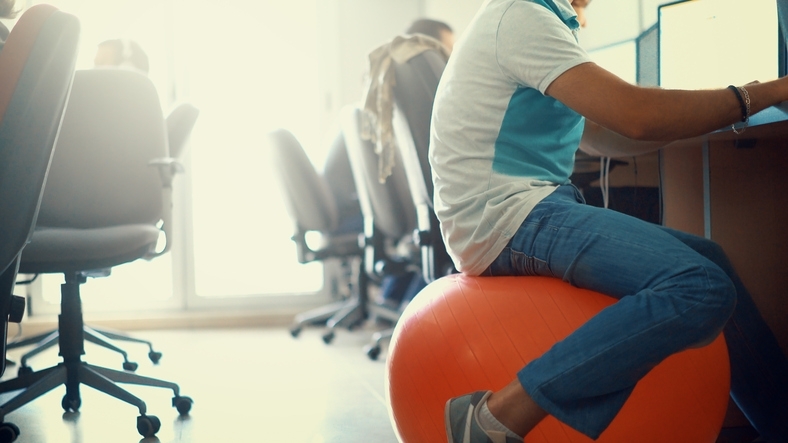 Do Exercise Balls Make Good Office Chairs? With health awareness continuously on the rise, there are some people these days who are opting to use an exercise ball instead of an office chair, but are they actually okay to use like this? Even though we all know the benefits of a good ergonomic office chair, there are still people out there who will insist on buying a cheap seat, but why is this so commonly the case? Unfortunately the office chairs that offer the best support for your body throughout the day are also usually the most expensive available. Buying ergonomic office chairs for your Melbourne business is one thing, but the seating won't do anything for your employees' health and safety unless they have been adjusted properly to fit the individuals using them. We have all felt it – that sticky, sweaty feeling when we get up from our office chairs at the end of a long summer day. It happens to everyone – you’re sitting at your desk at the office, trying to concentrate on the task at hand but you find your mind wandering elsewhere.